Turn down the temperature on your water heater to 120 degrees. That is the ideal temperature for most people. Don’t fear—you could still enjoy those hot showers. P.S.—if you have an old water heater with poor insulation, be sure to cover it with a blanket to help keep the heat in. Install ceiling fans. Fans help to circulate the air in an energy efficient way. This means you don’t have to turn the heat up so high in the winter. Reverse the rotation of your fans so that air is pushed down to you. In summer, remember make sure the fans pull the air up and away from you. Check your attic to ensure it is properly insulated. Insulate exposed pipes, too. Be sure to plug any air leaks that may cause drafts. Aside from obvious places like windows/ doors—look for leaks around electrical outlets, light switches, pull-down attic stairs and behind bathtubs. Swap out incandescent bulbs for LEDs/ compact fluorescents and choose energy efficient appliances. It takes investing more up front, but you’ll save a lot in the long term. When purchasing new appliances—look for the Energy Star logo. Replace air filters/ water filters. Make sure to stock up on the right sizes/ models to have in your house for the future. They should be changed at least once a year. Check faucets, toilets and pipes under the sink for leaks/ running water. Are you sure you’re not wasting water? Water usage during a colder month—like February—should not exceed 12,000 gallons for a family of 4. If you are using more, you may have substantial leaks you need to address. 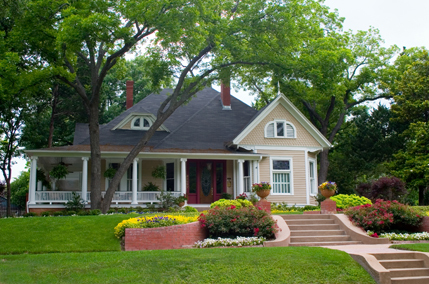 Plant some trees.Adding greenery to your yard makes your home more curbside appealing and valuable. Shady trees can also help you cut down on your cooling costs in the summer. **For more tips about protecting your investment—consult someone on our team! We are more than happy to help with anything you may need! Welcome to your new home! Top 10 Reasons to Sell Your Home—This Winter!